Yesterday could well have been my April Fools Day! 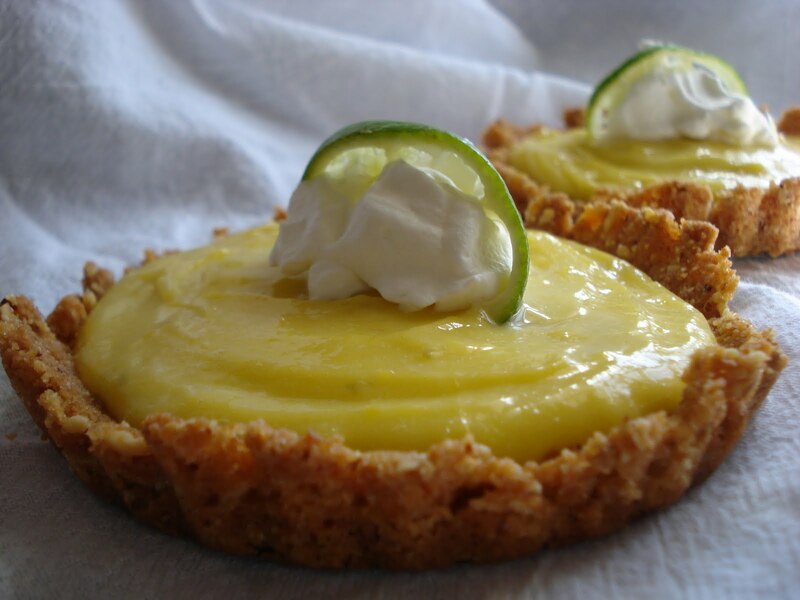 This tart recipe put me over the edge, between making the curd and then the crust. And it was all because of me, not the recipe! It is my submission to the gourmetunbound site for this month. The recipe is from Gourmet April 1996 issue and the end result is great! I read the reviews for the recipe, finding that many of the bakers said that the curd was runny. So I decided to try a few other recipes also, just in case the one that went with this recipe did turn out runny. I can't believe there are so many different recipes for curd! First the Gourmet recipe. It did come out a little thinner than the others I tried but really it was fine. Then I read Ina Garten's recipe for lime curd, and noticed her recipe was almost exactly the Gourmet recipe. Next I made Martha Stewart's Lime Curd recipe which came out just like mine. Then I decided to use my recipe for lemon curd, just subbing limes for lemons and it came out fine also. Whew!! That was alot of curd making! Then, the crust..oh the crust! I first made the crust using some of my almond biscotti, rather than the vanilla cookie crumbs called for in the original recipe. I've been wanting to use the biscotti for a while to see how it would come out and it was great. But the first time I made the crust I put a whole stick of butter rather than a half.. Disaster in the oven! The excess butter made the butter melt and drip onto the bottom and the oven gave off huge amounts of smoke like I couldn't believe! I had to open all the windows and turn on the fan to air the house out! At this point, I figured I'd better wait til morning to start all over again! So, that was my crazy day in the kitchen. This recipe is really delicious, though and well worth the effort, which if you make it correctly and pay attention to your ingredient amounts..unlike me..you'll be fine! I did make small tarts and I filled them with the Lime Curd from Gourmet's recipe. The amount, using my recipe would have to be doubled to fill one whole tart. So give it a try. And don't forget the whipped cream! **Note: I didn't choose to make the compote which accompanied this recipe**. Preheat oven to 350 and butter a 9" tart pan with removable fluted sides. 1. In food processor blend almonds, sugar and salt til almonds are finely ground. 2. In bowl, toss the almond mixture with cookie crumbs and butter and combine well. ( I used my fingers to combine). 3. Sprinkle some of the mixture into the pan, starting along the edges, pressing against the rim. Then fill in the bottom with the mixture, pressing evenly and joining edge. 4. Bake crust in lower third of oven for 10 minutes or til nicely golden. Cool completely. 1. In heavy saucepan, cook sugar, butter, eggs and lime juice over moderately low heat, whisking constantly, til mixture thickens and shows marks of whisk, about 10 to 15 minutes. 2. Immediately pour through a sieve, then add the zest and cool. ( This mixture can be made 1 week ahead and chilled. Be sure to place a piece of plastic directly on top of curd to prevent a skin forming). 3. Spoon filling evenly into crust and cover surface with a buttered round of waxed paper. Chill at least 1 hour or up to 24 hours. Garnish with whipped cream and, if not using the compote, decorate with some strawberries, blueberries or thin lime slices. Might have been a crazy day in the kitchen but it looks like the end result turned out great. I love the idea of using almond biscotti for the crust! Yes, thanks! Give it a try, a biscotti is, after all, a cookie of sorts! And the almond flavor is really nice.